“How to make sales easier and more beneficial?” is the question that arises in minds of many people. What resources to use: how do they work, which are worth investing, what to expect? In this article, we cover such questions by sharing the keys for good sales. We’re going to talk about drop shipping services aimed at various ecommerce platforms, including our favorite one, describing the most popular and worth looking at. You can also discover drop shipping extensions that will suit your Magento by checking these posts: The Best Drop Shipping Extensions for Magento & Magento 2 Drop Shipping Extensions. 0.1 What is drop shipping? Drop shipping service is a service that not only sells but also ships and makes orders for you. Basically, dropship services are online shops which offer wares from a variety of suppliers including such options like adding products to the website/marketplace you’re about to sell on. What’s the main purpose of drop shipping? You don’t need any space to store products you sell because there is a company that does it for you. Furthermore, there is no need to ship orders to customers – your drop shipping partner does this work. Sound’s intriguing, but there are more details to be discussed. In addition to the standard drop shipping model, you can discover lots of services that allow buying things for a wholesale price and reselling them for a retail price. For instance, you buy an item for $20, re-sell it for $70 on Amazon, eBay, or your e-commerce website, and get a $50 profit. Buy selling ten items per week; you get $500 in profit. 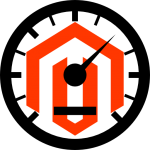 And there is no need to rent a storehouse, but how to connect the existing Magento 2 store to the chosen drop ship service? The answer is quite simple: you need a third-party Magento 2 extension. It is possible to find connectors designed to synchronize Magento with popular platforms, but usually, such plugins are aimed at a single platform only. We’ve gathered the best Magento 2 modules that cover all basic drop shipping needs and allows connecting a store to multiple services here: Magento 2 Drop Shipping Extensions. But there is one more solution we should draw your attention to. 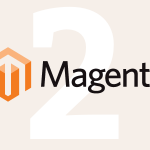 Meet the Improved Import Export Magento 2 extension. This module can connect your Magento website to any platform. It supports various import/export formats and provides the mapping functionality. Thus, the solution is extremely flexible and can be used as a universal tool for running a drop shipping business model. You can find more information here: Firebear Improved Import Export for Magento 2. And there are lots of agencies and developers to help. Doba is one of the best drop shipping services you can work with. There are multiple inventories and abundant assortment of backend management tools, including personal account contact, other drop shipping services rarely offer that. In essence, Doba is a mediator, that facilitates by finding the products that can be drop shipped to your purchasers. You have access to various products and other tools and resources that help you to sell them. Even though Doba has no warehouse for your products, but it gathers them from the suppliers (almost 200) it works with. Doba is the most high-cost drop shipping program we reviewed ($59,95). There are several plans you can subscribe to at yearly or monthly rates. Even though you can save some money with a yearly rate, Doba is still more expensive than other drop shipping services. With Doba Plan, you can have an inventory up to 1,000 products. With Doba Advanced plan – up to 10,000 product inventory and access to VIP-seller report. With Doba Pro plan – 25,000 product inventory and a VIP-seller report. Doba has a 7-day free trial, but signing up requires your credit card. You will be charged as soon as the trial expires. With trial, you have a limited excess, only 150 product inventory, and 10-times data export. However, you can still take a look at interface, products and the wholesale prices that Doba offers. 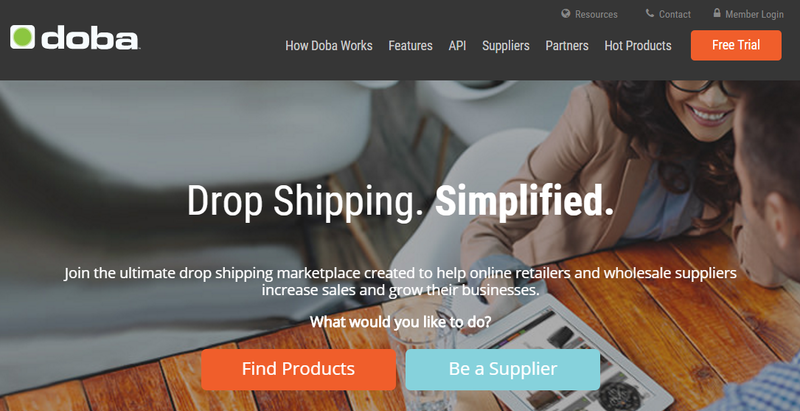 With the easiest interface, Doba has one of the largest product range among drop shipping services we reviewed. There are over 2 million products that are available in Doba: furniture, jewelry, beauty and health, electronics and many others. With online platform you can you can easily browse products (by brand, supplier or category) and then add them to your inventory. There is filter option too – by price or shipping. Exporting products is one of the steps you can struggle with, but not with Doba! The products you want can be easily added to your marketplace or website, even in a large amount, through a variety of formats (in XML, CSV and over 50 other). There also tools, that allow you analyze the performance of products and when your products go out of stock or have low inventory, you can create notifications for them. The only disadvantage, that we found, is that Doba doesn’t offer any supportive options in making a website. 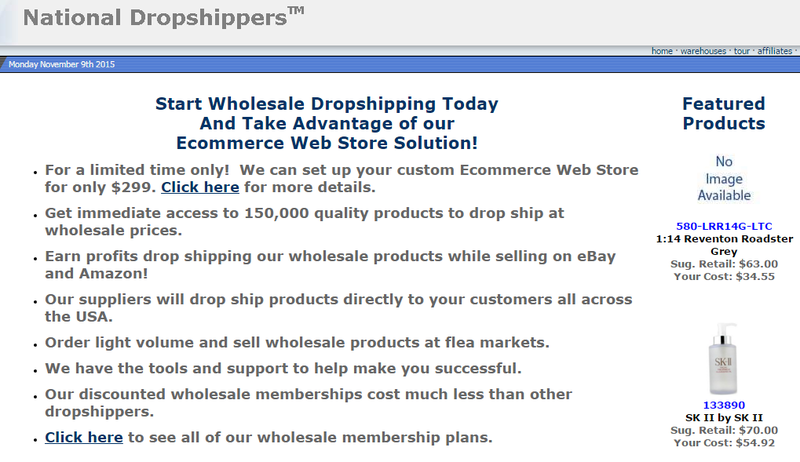 Another service that makes drop shipping going smoothly is Dropship Direct. It is famous for its lowest cost and at the same time high data feed options and a great variety of products. In such categories as automotive, electronics, home goods, and apparel can be found products, gathered from nearly 100 suppliers. Notification options will show your products’ status in inventory, and hot top-100 report by Dropship Direct will highlight for you best-selling products. Push List data feed technology provides Dropship Direct with excellent backend management. With this option, you can use preconfigured feeds for more than 25 supported marketplaces or customize them as you like. No monthly or yearly subscription fee makes Dropship Direct unique. It is free even for signing up. You will be charged only for using Push List technology; it’s $9.97. The price can be waived depending on your sales thresholds. There is a 15% restocking fee, that makes you responsible for the customer service, while drop shipper controls the shipping and deals with returns. If you want to use Dropship Direct, it is good to be aware, that you need to login to your account when a customer orders from you and make it work through the site. The good news is you don’t need to contact suppliers directly because Dropship Direct manages the relationships with them. Drop shipping speed always depends on the supplier. There are flat rate shipping options (nearly 50%), USP rates and free shipping. This dropshipping service offers the best shipping options, a significant amount of products (over a million) and multiple plans, that help selling. The available categories are sporting goods, home, health, electronics, entertainment, and apparel. By addicting the product in watch list you receive notifications if they go low in inventory. There isn’t a good choice of tools, that can help analyzing the performance of your products and your sales. With the reasonable price $24,99, Wholesale2b offers wide payment options: there are 4 different plans for monthly or yearly payment. The yearly rate can save you some money. Depending on the number of products you plan to sell, you can always find the best one for you. For instance, Amazon or eBay plans fit the best if you sale through an online marketplace. If you use your own website, Wholesale2b provides with a data feed of the products, but this option is not free. These data feeds are compatible with most of the providers of the shopping cart. Some more extra payment will be required if you want a custom feed. Wholesale2b has also a plan, that can build you a website if you don’t have one. There is a free plan in Wholesale2b that opens up available products, you can look through. No card info is required when you sign up, but it is always good to check the products before you commit. There are credit card processing fees and restocking fees (are different depending on the supplier), but you won’t be charged for drop shipping. What you will not find in Wholesale2b is customer support: no phone number or e-mail address mentioned and there is a lack of a drop shipping forum. The only possible way, we have found, was through the support ticket system. Meet another drop shipping service with a nice dropship design, that based in Los Angeles, California. Even though Sunrise Wholesale doesn’t offer a high amount of products (near 16,000 from 7 suppliers), it is absolutely worth considering, because of a good range of features and reasonable prices. Even with small inventory, Sunrise Wholesale has a variety of categories, such as home decor and electronics. You can export your products with images and descriptions to Amazon, eBay or your website. There is also integration with Bigcommerce and Shopify. Selling through eBay is supported with stronger features than through Amazon: integration of your eBay account with the list of products straight from the product page; analyzing products in the market – gives you the opportunity to adjust proper prices. The membership fee in Sunrise Wholesale is $29,95. Monthly and yearly rates are available, where the yearly rate is the most reasonable. The service doesn’t include a fee for shipping or minimum order amount, but for non-defective products, that your customer returns, you will be charged 20%. Sunrise Wholesale provides a 7-day free trial, that allows you to see the products and features, but a credit card is required to sign up. Sunrise Wholesale has standard shipping options, including blind day shipping and order tracking. Orders, made before 1 pm Pacific time, will be shipped that day. As usual, shipping time is 5 – 10 days. This dropshipping service provides some educational resources, like FAQs and video tutorials. Customer support is offered through the phone and email. This dropship service came from New Hampshire, has a bag of bones in dropshipping and lacks some features. But at the same time, it offers a wide product selection (around 111,000) and quite good shipping timing. With many inventory and back-end features, you are able to export products and their images and descriptions to the marketplace or shopping site. Because of one-format export, only lists of each warehouse can be exported. That means, with National Dropshippers you have more work on your part. The service can create a website for you for extra payment and provide notifications, in case inventory of products goes low. This option doesn’t work for new products. There aren’t any tools to help you making a decision what to sale. With the cost of $19,99, National Dropshippers has different plans, that include also an option – lifetime membership payment. It has also the most expensive website plan, we have seen: the service creates a website and loads it with products. There is no free trial. No prices are available until you sign up. Fee for dropshipping itself is standard, in addition to handling and shipping costs. This service has the best shipping speeds, of the ones we reviewed: it can take from 1 to 3 days. National Dropshippers is no-frills drop shipping service, concerning shipping and includes such basic figures like order tracking or blind shipping. Login is always required to order the products when you want to sell them. There are phone and email available to contact. National Dropshippers doesn’t provide any educational resources. Inventory Source is a drop shipping company known for its wide backend features, great inventory, and strong account support. However, shipping options and costs associated with it are not without shortcomings. The good news is, the service provides direct contact with suppliers, but you will also need put more efforts working with this one. With a good amount of products (more than 1,000,000) from near 100 different suppliers Inventory Source has many features that enable it to be among the top drop shipping companies. For instance, using data feed, you can export products with descriptions and images to the online marketplace or your website. And if you don’t have one, Inventory Source can create for you. The service itself costs $25. It charges you also for each supplier you use. For the first supplier you pay a set monthly rate and for each one you add after, payment goes down a bit. Data Feeds costs cheaper than a website, built for you. Depending on the supplier you work with, dropship and restocking fees, handling and shipping costs can vary. For those, who are new to drop shipping, you can find a good variety of teaching resources: video tutorials, guides and more. There is also a good account support through email and phone. Inventory Source doesn’t provide a complete list of all available products on the website, but still depending on the plan you’ve purchased and on the suppliers you work with, it can be possible to combine the products in one data feed. 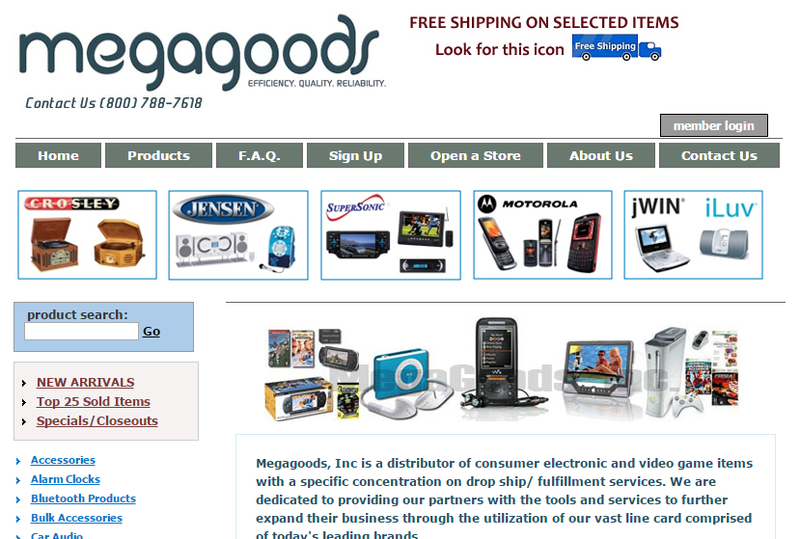 Megagoods is another drop shipping service that specializes in electronics and has a small inventory of products, only 2000. However, it is a good option for those, who want to sell in a certain field. There is also a lack of product notifications and analytics features, but at the same time, it has a very reasonable cost. Exporting the products can be done only in a few formats. Because images are not stored, they are available only in ZIP. Downloading is an extra work, that is required while adding products to your sell-platform. With the membership cost of $14.99, it’s the lowest fee per month for the services we reviewed. There is only one plan, that Megagoods can offer you, but there is also a 30-day free trial, that enables you to consider, whether you want to use this service or not. There is a drop shipping fee per order and 20% restocking fee, but the last one will be returned back. It is good to know, that you are responsible for the customer service, even though drop shipping service does the shipping of the products. It is possible to contact Megagoods per email or phone. If you have any technical problems, there is a support ticket system. 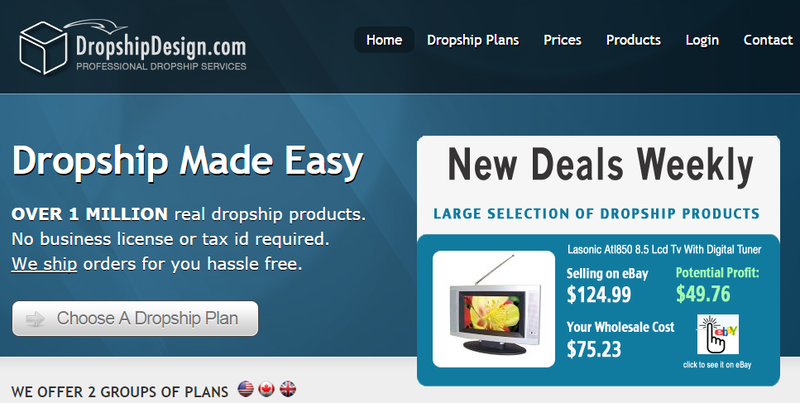 Another well-known drop shipping service is Dropship Design. It has a good variety of products (over a million) and plans. Even though the service offers good prices and proper shipping, it doesn’t provide a good account support. On one hand, it has important back-end features, good inventory, and export of products with images and descriptions, on the other hand, there are limitations on marketplaces you can use, for instance, eBay, but Amazon or other online marketplaces.Dropship Design saves time and makes order process easy if you’re signed up for website plan. With the range of standard shipping options, this process can take from 5 to 10 days. With the device cost of $49,99 you can choose a plan for you from 4 different plans, that are offered: “basic dropshipping plan”, “data feed plan”, “eBay plan”, “website plan”. The good news is, for all the plans, except website plan, you’ll need to pay only one time. Website plan requires a monthly fee. For merchandise without defect, there is also a restocking fee. There are no research tools and analytics that gives clear information about the products suitable for selling. And you won’t get any notifications about arrival of new products. Talking about account support, there isn’t any email or phone number you can use. The only option is a support ticket. 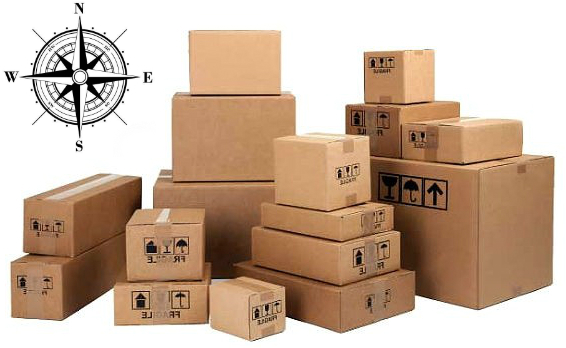 Drop shipping services offered by Smart Living Company is one of its tools for selling goods. With almost the smallest inventory, this service offers products for home decor and lighting and also such products as furniture. If your interest is focused on goods for home as a selling field, Smart Living Company is a good choice. Even though the variety of products is high, you won’t be able to export your products anywhere. $19,95 is the offered price. There are different plans for a monthly cost each. There is no free trial and no need for an account to browse products. While handling and shipping are on Dropshipper, you are responsible for customer service. This dropship service offers the best customer support from the ones we’ve relieved. The ways of contact are by phone or email. There is also an option “one-on-one mentor” that can be useful for your business. This dropshipping service is one of not many that has wide array of options, more than 3 million products, and from around 500 suppliers. Different plans have different features. For instance, the directory plan gives you access to the whole list of suppliers and allows direct contact with them. With website plan, the service is going to process orders from you. Shipping speeds depend on the supplier. For Dropshippers.com you’re going to pay $99.00, but the membership fee varies on a plan you choose. For instance, the directory plan requires one-time payment, but website or auction plan have monthly fee. There is an opportunity to choose the all in one membership, where all plans are combined. A free trial will show you the suppliers you can possibly work with. The drop ship fee is one of the highest from all dropship services that we’ve reviewed. The customer service is poorly represented: phone and email don’t really work. The questions we asked were never answered. Teaching resources, such as eBooks and tutorials can be found through Dropship University. The service that takes care of shipping, while you can focus on profits and sales. 365 DropShip offers a variety of products (around 1000) in different categories. When you sell products on your website, you won’t need to deal with inventory and stocks. The service has features that help you to control the prices and track orders. There three plans you can sign up for Basic, Pro and Enterprise. The first one doesn’t require a monthly payment compared to the rest. You choose the plan according to the options you would like to have. Minimum order is not required in any of the plans. There is also a 7-day free trial, that will give you an opportunity to consider if you want to use this service. For contacts, you can use email or support ticket system. 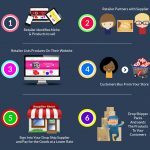 This dropshipping company is a good deal for business because you can earn up to 70% on each sale. Moreover, you just pay for the products you sell. This was our list of the best drop shipping companies. What is your favorite solution? Your replies are important to us and other Firebear’s readers. Why did we decide to add Salehoo to the list of the best drop shipping services? First of all, it has happened because of a huge wholesale directory that includes more than 8,000 companies. Thus, you get access to over 1.6 million products. Consequently, you can easily find everything you want to sell on your Magento 2 store or via a marketplace. User-friendly interface with a precise search feature is another vital aspect why the Salehoo drop shipping platform is so popular among merchants. The third important reason to use Salehoo is security. All suppliers are verified so there is no need to be afraid about malefactors within the system. And if you have any troubles, always contact the support team – they will immediately help you. It is even possible to ask for a list of suppliers related to certain product categories. In addition to the support team, there is the Market research lab designed to find which types of products are more likely to bring you higher profits. Don’t forget about a community forum, where you can ask questions and help other merchants. The Salehoo drop shipping platform is relatively budget-friendly. You only have to spend just $67/year to enter the game. Don’t hesitate to check one of the most affordable drop shipping solution providers on the market. 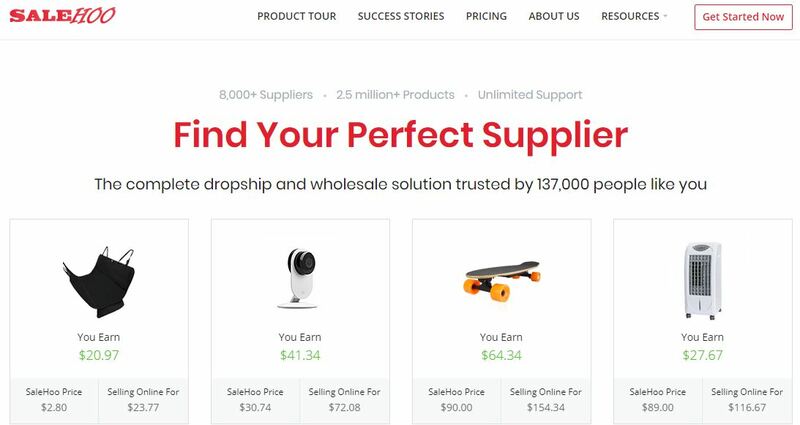 What’s the biggest problem with the Salehoo drop shipping platform? You cannot check its functionality for free since there is no free trial. It is only possible to pay for the service and give it a try. If you are dissatisfied with Salehoo, the platform offers a 60-day money back guarantee. So a refund is not a problem. Another drawback is a vast amount of information offered by the platform. Sometimes it is necessary to contact the support team to get full understanding of what’s going on around. Be careful; otherwise, you might miss a lot of important things. The Worldwide Brands platform offers even more suppliers than the aforementioned solution. The company’s directory includes 9,000+ partners and literally millions of products. There is also a high-security level so you don’t have to worry that a chosen supplier may be a malefactor. And there is only a one-time payment that provides the access to the whole ecosystem. The one-time fee mentioned above is just $299. Of course, if you want to try drop shipping for just a year, it’s better to get started with the aforementioned platform, but in case of serious plans, choose Worldwide Brands – the platform will help you reduce expenditures and connect your business to a huge database of suppliers. It is also necessary to mention that you get a relatively limited functionality by choosing Worldwide Brands. Other drop shipping providers often offer automated listing tools, website packages, custom file uploads, and many other useful instruments. Unfortunately, the access to them is absent if you work with Worldwide Brands. And beware of upsells: the platform will try to foist something on. Offers, coaching, and books might become annoying very soon. 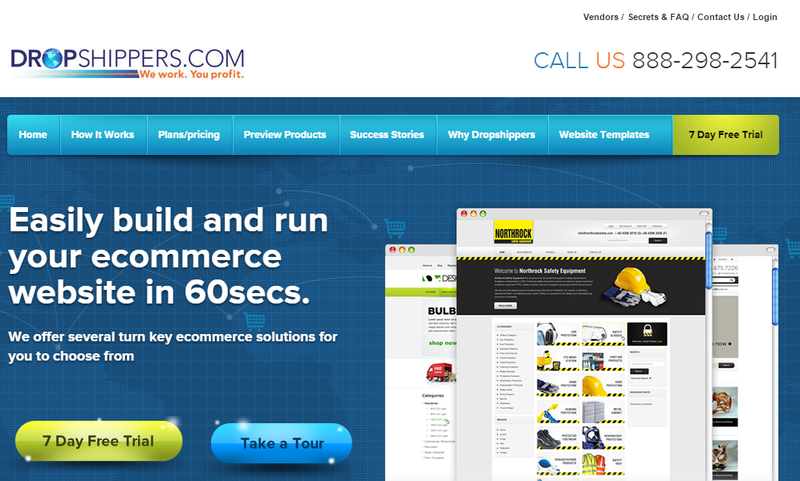 It is a smaller drop shipping company that offers just 100 suppliers with 1 million products. The platform allows using data feeds to export products, so you can easily import descriptions and images to your Magento 2 website using our Improved Import Export. There is even an opportunity to create a website with the help of the company, but we recommend you to choose Magento Open Source instead. From the first sight, Inventory Source seems the most merchant-friendly platform, since the company offers a forever free plan. But you will be charged for each particular supplier: pay a monthly rate for 1 supplier and a smaller rate for each additional one. There are several factors that influence fees. First of all, it is your plan. Then, the system charges different amount of money depending on what you use it for data feed fees, dropship fees, restocking fees, and shipping and handling costs change depending on the selected suppliers. In case of the free plan, it is necessary to do lots of manual work including direct contacts with the suppliers. Also, note that the Inventory Source dropshipping provider doesn’t list the full catalog of products on the platform, which also makes the business a little bit more difficult. First, we were distracted by the design of this website, but after a few minutes of browsing found it very useful. Don’t let the outdated interface scary you. The Wholesale Central company offers a quite decent tool for filtering through many categories, including apparel, electronics, and leather. 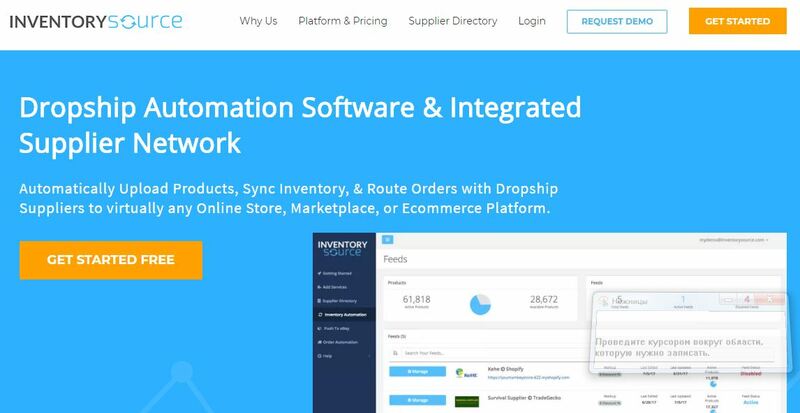 With the drop ship provider, you connect your business to more than half million items by 1000+ trusted wholesalers. All the necessary details are displayed on the website, so you only have to click on them and get the information. You can sign up for free with Wholesale Central. No paid plans, no fees. Looks suspicious, isn’t it? First of all, don’t forget about the design of the platform. Then take into account that when you click through to one of the drop shippers, the platform redirects you to the manufacturer’s website. There are no middlemen to work though, so you have to do everything manually via the direct connection with manufacturers. With Oberlo, you will easily start a drop shipping business with just a few clicks. The platform has a user-friendly interface and a direct integration with Shopify. The database of products available for drop shipping includes more than 85 million items. There are three plans: Starter, Basic, and Pro. The first one is free, but it is limited to 500 products and 50 orders per month only. The Basic plan costs $29.90 per month and you are limited to 10r products and 500 orders. In case of the Pro plan – $79.90 per month – orders are unlimited and the number of products is 30k. Oberlo is an application which works exclusively with Shopify, so you won’t be able to use the application on your own standalone website, but you can add it on Shopify and you can get all products with a few clicks, but don’t forget to watermark your images and change the title and descriptions of products. You might have heard about the success story of Jack Ma. If not, check the corresponding Wikipedia article. No one believed in Alibaba; but now, it is one of the leading providers of suppliers and manufacturers online. And of course, you can fully leverage the platform in order to add the drop shipping model to your existing business. The platform’s audience is incredibly wide because it offers products in such categories as electronics, apparel, home and garden, beauty and personal care, etc. Also, note that there is a huge community of enthusiasts and professionals around Alibaba, so you can easily get answers to all your questions. The interface of the platform looks fresh and is easy to use. One of the most surprising aspects of Alibaba is the prices, which are very low. Thus, it is possible to get the highest possible profit working with the suppliers from the platform. Simply type ‘dropshippers’ in the search window to filter your future partners from the manufacturers and suppliers. Since there are thousands of reliable drop shippers in Alibaba, you can also apply a region filter – this will narrow down your selection essentially. 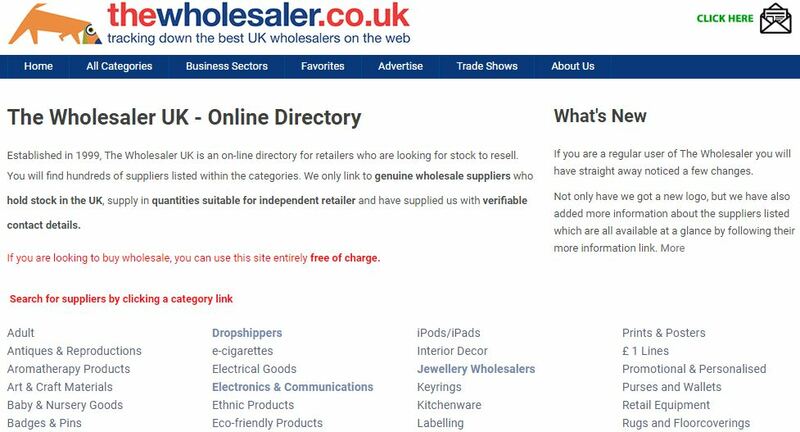 If you are looking for a UK-based wholesale directory, try TheWholesaler.co.uk. It’s the largest platform of its kind in the region. And it’s absolutely free for anyone looking for drop shipping wholesalers in the UK. Of course, there are many different categories and subcategories, so you should spend some time learning how the drop shipping platform is organized. Unfortunately, the functionality of the store is limited. 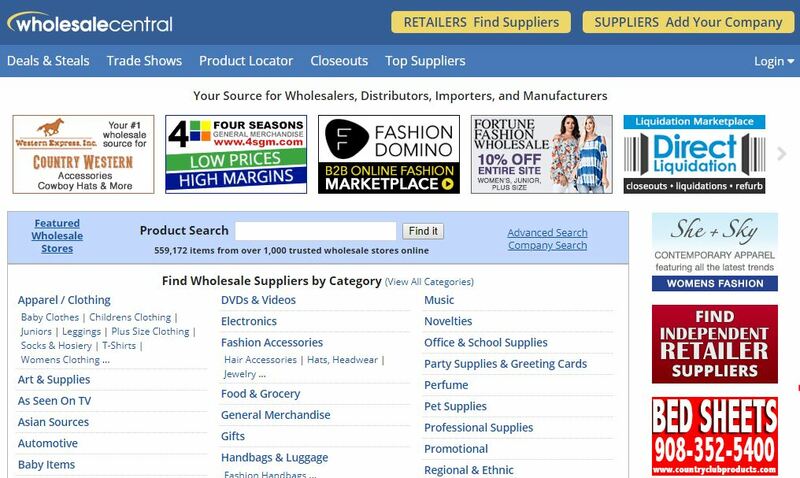 It’s nothing more than a listing board for wholesale companies where you can discover drop shippers as well. No individual products are available. But it’s not a problem since there is enough information about each supplier so that you can find future partners with ease. The platform redirects to the companies’ websites, where you can view their merchandise and contact information. If you are based outside the UK, this platform won’t be very useful, but you can still find a solution that suits your business needs in this article. There are two core options offered by TheWholesaler.co.uk. You can choose a one-time payment that is $299. You will get lifetime access. Note that no monthly or annual fees are charged. At the same time, the payment can be split into three transactions with Easy Pay Plan: $99 today and 2 monthly payments of $110. Being the largest database of UK-based suppliers, TheWholesaler.co.uk offers access to such licensed goods as provided by Disney. But you get a slow customer support and lots of manual work that requires searching and calling to communicate with suppliers. 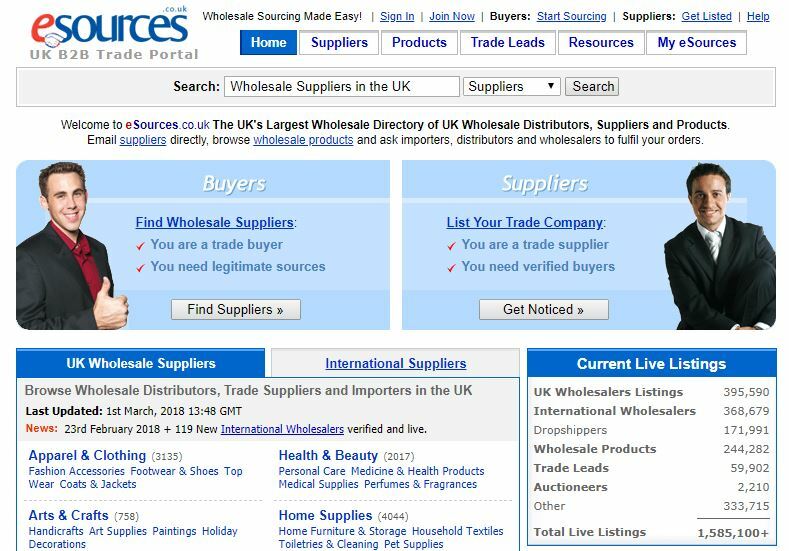 eSources is a UK-based B2B portal where you can find reliable drop shippers. It offers more than 350k different domestic wholesale listings and more than 170k drop shippers. But there is a more important feature associated with eSources – the TradePass verification system. The portal offers a lot of companies, but the most reliable ones get the TradePass logo next to the name. The logo indicates the high-security level that was achieved after authentication and verification run by eSources. The service is free for buying products but if you want to contact companies you have to spend £20 per month. Of course, it is more profitable to spend £50 for six months or £75 for a year. Once again, we have to deal with a platform that is closely related to a certain country. So if your business is situated outside the UK, just check another provider. Also, note that membership fees for some buyers may be charged. Toptenwholesale is the USA’s leading wholesale trade platform. Here, you can connect with drop shippers and other suppliers, since it’s a trade board. Thus, there is only a listing of products and suppliers. Although the navigation is not the most user-friendly, there are also lots of tasks that should be done manually. Note that a lot of the products can only be bought in bulk, so the platform is aimed at big businesses first of all. It may not be the best deal for drop shippers, but you can still implement this model using Toptenwholesale. You can start a free 30 day trial with full features and no obligation. The next plan is $79 per month. Alternatively, you can pay $425 for 6 months or $799 for a year. It is necessary to mention that some company’s suppliers and products pass the verification. There are many suppliers from the United States, which can be an advantage. The platform is not beginner-friendly. Being based in China, Globalsources is solely focused on large-amount orders. If you are a supplier, you can discover a large collection of goods and other suppliers. Note that there is a limitation on the number of orders. Therefore, we recommend you to choose Alibaba instead, but you can always buy in bulk at Globalsources. Registration for the basic services of the platform (product and supplier search and inquiry) is free. No hidden fees are charged. The platform is especially good for wholesalers who are looking for a detailed directory and product selection. There is also a white label for better branding. Since the platform is situated in China, you get high shipping times and a communication barrier. Unfortunately, only bulk orders are allowed. If you are a merchant with a few orders, choose another drop shipping platform. As you can see, there are many different drop shipping services and platforms. Some of them are aimed at certain e-commerce solutions only, while the others allow you to leverage the popular business model on every online storefront or marketplace. And to integrate all of them with your Magento 2 website, you can use the Improved Import & Export by Firebear. The extension allows importing all possible products to your Magento 2 store automatically. Thus, you eliminate a huge part of the boring backend routine which is often based on manual actions. At the same time, the Improved Import Export Magento 2 extension provides the ability to export all orders to the selected drop shipping platform. 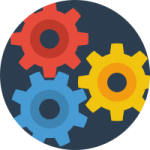 The process is fully automated and runs according to a predefined schedule.